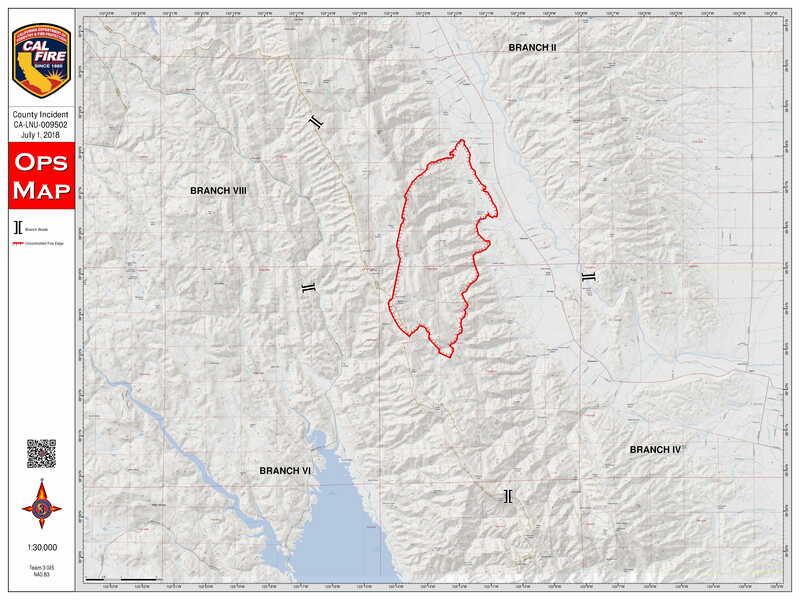 The County Fire burning near Lake Berryessa has grown to 82,700 acres in the rough, mountainous terrain of Yolo and Lake counties and is now threatening over 1,000 structures. So far, the fire is 25 percent contained. NAPA COUNTY, Calif. (KGO) -- The County Fire burning near Lake Berryessa has grown to 82,700 acres in the rough, mountainous terrain of Yolo and Lake counties and is now threatening over 1,000 structures. So far, the fire is 25 percent contained. Over 2,800 firefighters are still battling the blaze that nearly doubled in size on Monday. Most of the action, today, will happen around the small town of Guinda, on State Highway 16, which lies near the eastern side of the fire. "The fire laid down, last night," said Cal Fire spokesman Israel Pinzon. Crews worked all night building containment lines along the fire. Brown said the blaze started Saturday and is surging through rugged terrain northwest of Sacramento amid hot and dry weather. "The weather is better than what we had last weekend. But it's still hampering our efforts and it's an area of concern," he said. So far this year, wildfires have burned 4,200 square miles in the United States, according to the fire center. That's a bit below last year's acreage to date - which included the beginning of California's devastating fire season - but above the 10-year average of 3,600 square miles. Cal Fire officials say their goal is to have full containment of this fire by next Tuesday, July 10, 2018.